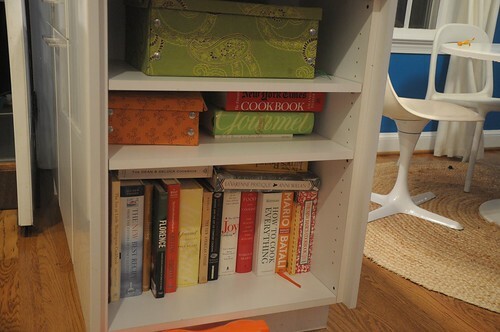 A couple of months ago we featured the fabulous color-coded bookcase designed by my friend Liz Cherry. Last week, I visited Liz again to take a tour of her renovated kitchen — the transformation is nothing less than remarkable. Liz and Cameron bought this 1940s cape as-is in 2009. 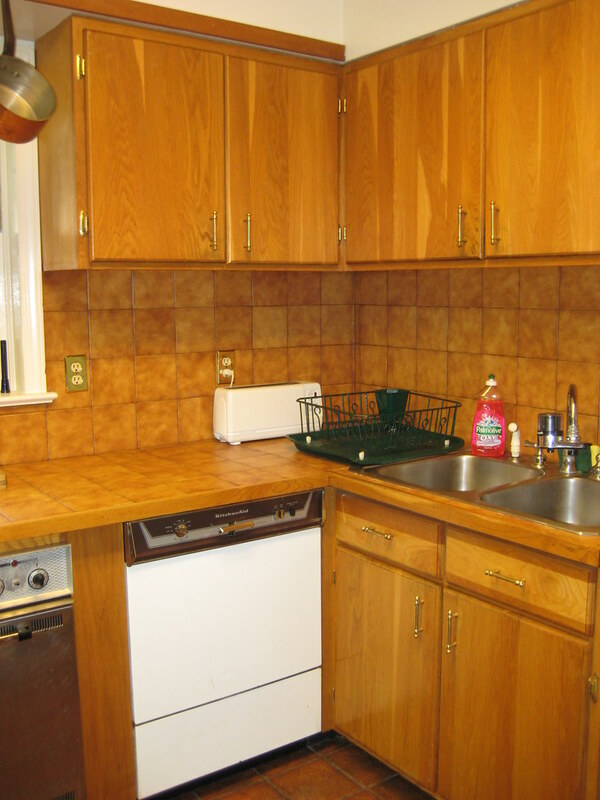 Aside from repainting the walls and having the wood floors refinished, renovating the kitchen was a major priority. The kitchen came with an overdose of dark caramel colors. 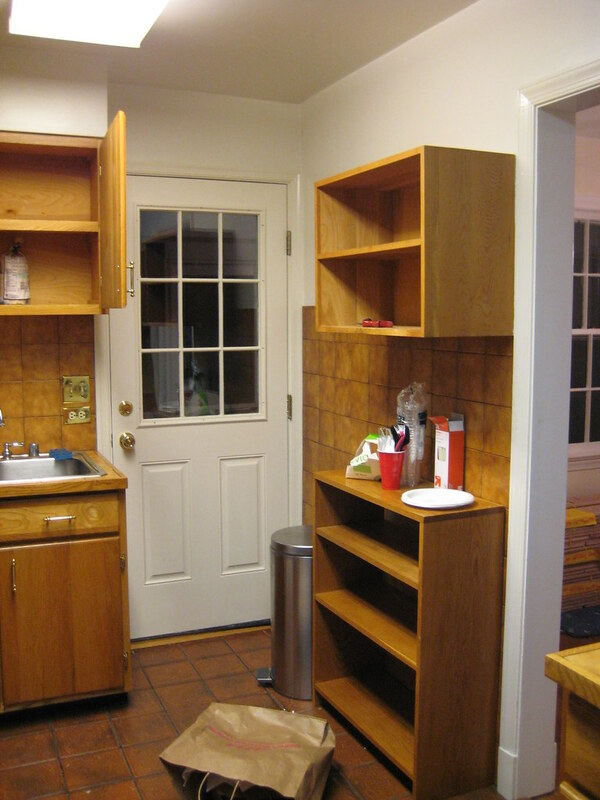 Those cabinets without doors (and not in a trendy open shelving kind of way) are awkward and confusing. And topping the list of weird features were the side-by-side ovens. The one on the left from the early 1990s didn’t work. The one on the right is the original and when it was used (yes it still worked!) the outside got about as hot as the inside. It finally conked out, but not too soon for Liz to burn herself on multiple occasions. Don’t let its cool retro look deceive you. 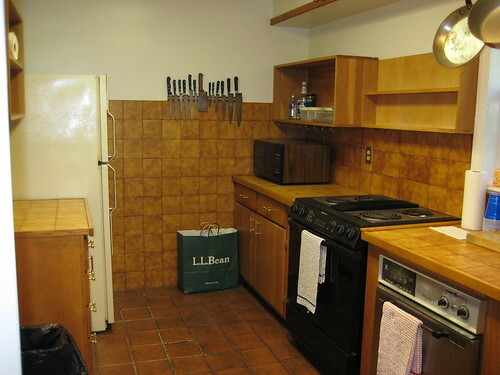 The layout was also awkward — a refrigerator at the far end, sink at the other — and a wall to the dining room further enclosed the kitchen from the rest of the house. Dark and cavernous, it hardly inspired the next culinary masterpiece. Liz and Cameron are big DIYers. 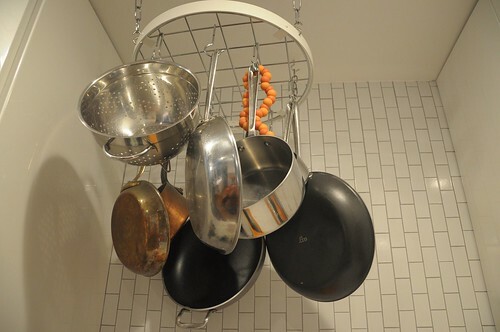 In fact, among other projects, Cameron remodeled the kitchen in their last home. But since DIY projects tend to take a while and Cameron’s time was focused on finishing up law school and taking care of their young son, they decided to leave this reno job to the pros. I’ve always envied Liz’s keen eye for interior design. She created the plans for the kitchen, picking out colors and features that would be timeless, functional, and a better use of limited space. I especially like her decision to use vertical mini subway tiles — a unique feature that moves your eye up to the ceiling. The wall dividing the kitchen and the dining room was removed, creating an open feel and adding space for a peninsula. The peninsula holds cabinets on one side and a shelf on the end for cookbooks and kitchen accessories. It transitions nicely into the dining area, functioning as a serving area or buffet. 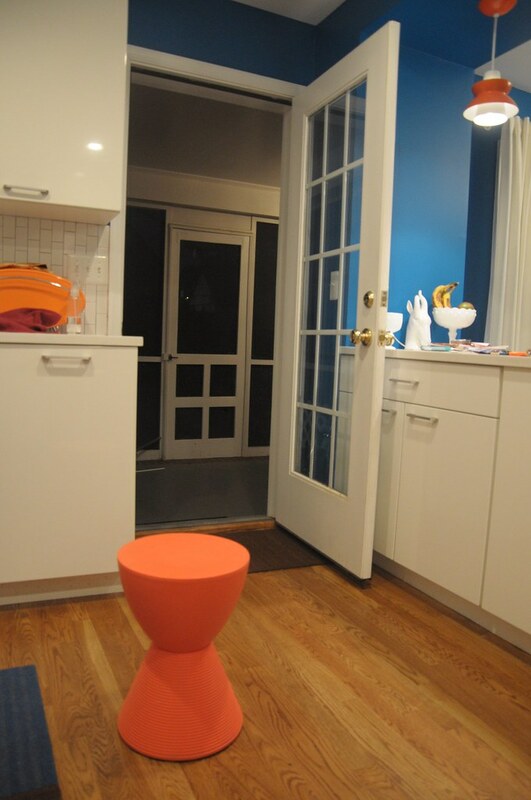 Liz chose a classic blue, white, and orange color palette for the room. The walls are Benjamin Moore’s laguna blue (also featured here). 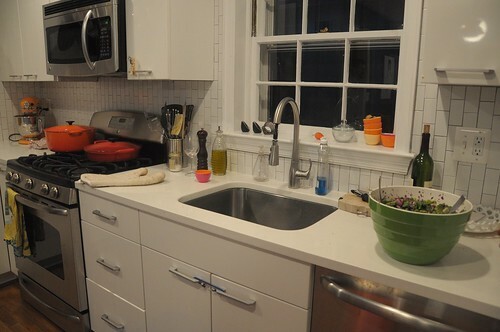 The white cabinets, caesarstone counter tops, and stainless steel appliances are from Lowe’s. 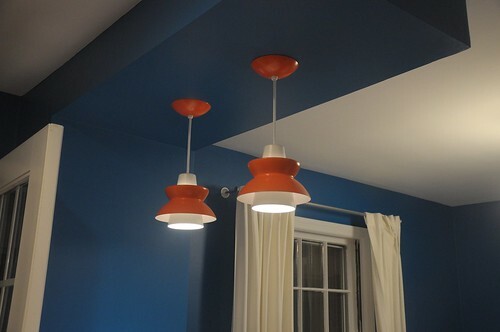 Throughout the room, you’ll find fun pops of orange with the toaster, blender, mixer, and on these funky pendant lamps. They also reconfigured the layout. 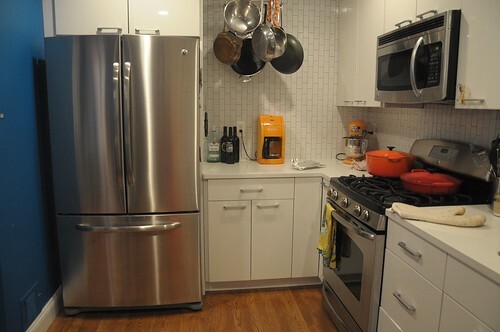 They rotated the refrigerator 90 degrees clockwise, adding space for more cabinets and a hanging pot rack. The sink, which used to be by the back door, now resides in a much happier spot under the window. White and crisp, the room is like a dinner plate ready for a delicious meal to be served. Toss in fresh accent colors with some stainless steel appliances and an incredible culinary experience awaits. where is the stool from?? I need two in RED! It’s the Sasha Hourglass Sitting Stool by Ital Modern and you can order from hayneedle.com. Looks like they only come in a orange and green though. Also check out the Calie Hourglass Stool — comes in white and a little less expensive. Katie – another great feature story! Did Liz and Cameron DIT? T=themselves. Whatever the case, it really looks great. 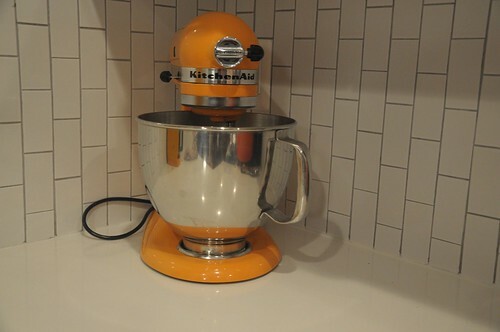 Paul and I were considering reno-ing our 1970’s kitchen. Alas, the project is on hold. But we did tear up a nasty carpet in the living/ dining and hallway as well as some crappy old lino from the kitchen to expose some pine floors. BIG project. I wish we’d taken more “before” pics, though. PS – say ALOHA to Liz and Cameron. They didn’t DIT, but they DIT’ed their previous kitchen. Do you have house pics on Flickr we could link to? Love the lamps over the peninsula! Where are they from! Do you have problems opening your left fridge door all the way? I am about to buy a house where the set up is the same to the left of the fridge and didn’t know if you could give me some insight..